persuading voters jihadi terrorists presented a serious and growing danger to Canada, another threat appears to have been brewing up right here in Alberta. But instead of jihadist crazies, the death threats and ugly misogynist commentary directed at Alberta's NDP government, and in particular at Alberta Premier Rachel Notley, seem most likely to have been generated by "old stock Canadians" who subscribe to a particular social and political point of view. That is to say, the sort of Tea Party Tories who viscerally hate Liberals and New Democrats with equal and consuming passion. The violent and threatening discussions mostly flew under the radar through the federal election campaign until a few days before Monday's vote, when the statements began to generate social media commentary on progressive sites and a few news reports. Here's a typical comment, an apparent reference to Premier Notley, posted back on Sept. 20 on a "community" Facebook page called "Albertans Against the NDP": "Is there something, or does someone know of anything that will get this skag out of Alberta and politics????? ?gotta be someway short of. … u know….. bang! Lol" This is (sic), as they say, meaning this comment has been transcribed exactly as it appeared on Facebook. Numerous similar comments referencing assassination, as well as others adding obscene, violent and disturbing commentary, appeared on this other social media sites. A screenshot including the comment quoted above -- suitable for mature readers -- may be viewed here. 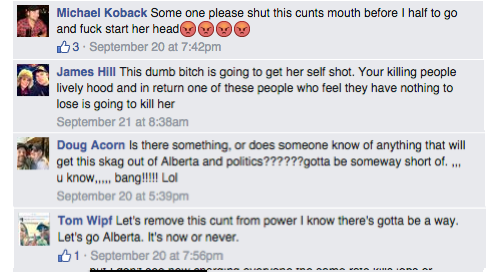 Another so-called community site, "Out the NDP in Alberta" was also reported to contain similar remarks. Police and the Notley government, at least in their official public statements, appear to be brushing off the threatening rhetoric as the work of disaffected cranks. The RCMP told the CBC they are aware of the online threats but refused to say if they are conducting an investigation. "Our first concern right away was to ensure the premier's security detail was aware of what we were seeing," an RCMP spokesperson said. For her part, Notley coolly dismissed the sites. "I'm told none of what has occurred thus far with me is in any way, shape or form out of the ordinary," she told the Edmonton Journal. "I think it's part of being premier probably in almost day and age. Politics is politics." Barbara Starr, an administrator of the "Out the NDP" page, dismissed the commentary there as "a bunch of us joking" in an interview with the CBC. She complained that it's NDP and Liberal supporters who are stirring up this controversy. In a rambling response to my query, an anonymous administrator at the "Albertans Against the NDP" site blamed people who "create fake profiles and post nasty comments as our followers with the intent of getting our page negative attention." He or she claimed "we are dealing with a cyber-bullying situation." "We are conservatives, we are not radical people, nor are we violent. We do not wish and (sic) ill will on anyone, especially prominent politicians. We want accountability, nothing more," the anonymous administrator said. That Facebook page has since been taken down for a couple of days and scrubbed of the most offensive comments. In a commentary posted on the page last night, the administrator(s) also apologized to the premier. Who is behind these groups is not clear. Former Sun Media commentator Ezra Levant's Rebel Media website has provided extensive coverage to the group's activities, but Levant would not respond seriously to my question about Rebel Media's role, if any. Alberta Progressive Conservative Party Leader Ric McIver turned up at a sparsely attended rally organized by the group in Calgary on Oct. 17, posing for a snapshot with rally organizer Julie Franz, whose remarks can be heard in this Youtube video. Meanwhile, the inappropriate discussions among the violent haters that ended up on the group's Facebook page no doubt continue, but in locations where they are not so easily stumbled upon by social media users or monitored by police and the premier's security detail. Canadians need to ask if the divisions created by the tactics used in the unsuccessful recent Conservative Party of Canada reelection campaign, which happened contemporaneously, exacerbated the ugly and violent tone of the anti-NDP rhetoric on these social media sites. The police need to take this seriously. History shows exhortations of violence lead to violence. And can you imagine what the reaction would have been even a few days ago if these violent threats had been made against a Conservative politician by someone who wasn't, in Stephen Harper's notorious words, an old stock Canadian? Premier Rachel Notley will announce changes to her cabinet at Government House in Edmonton today at 10 a.m., the government announced yesterday evening. And it announced nothing more, other than the fact there will be a media availability, as they say, after the announcement. Details to follow.